In Salem, Oregon during the Great Depression, aviator and mechanic Lee Eyerly was building pilot training devices that were so thrilling, they quickly gained more popularity at fairs and carnivals than at flight schools. Frank Hrubetz (pronounced with a silent ‘H’), fresh from Oregon State College with a degree in mechanical engineering, was hired as Eyerly Aircraft Company’s chief engineer. After several years of working with Eyerly and helping to develop some its most popular rides, Hrubetz began his own amusement ride business. Frank Hrubetz & Company was founded in 1939. One of their first creations was the Spitfire, which some believe was based on the Eyerly Fly-O-Plane. Spitfire had small planes that could be tilted side to side or into a full roll by the riders as they spun around on a slanted wheel.¹ Twenty years later in 1959, Hrubetz introduced the Paratrooper and advertised it as a “new version” of the Spitfire. Parachute-like gondolas replaced the planes, but otherwise they were so similar, owners of Spitfire rides could buy a kit to convert their Spitfire into a Paratrooper. Hrubetz became one of the most successful ride manufacturers in the world in the ’60s and ’70s and produced a variety of rides until a few years after its founder’s death in 1987. 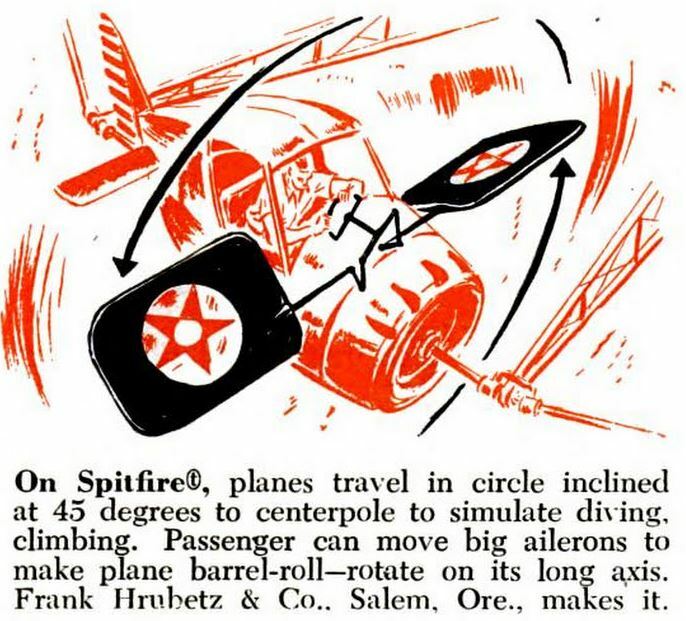 Explanation of Spitfire’s movements from the July 1949 issue of Popular Science Monthly. 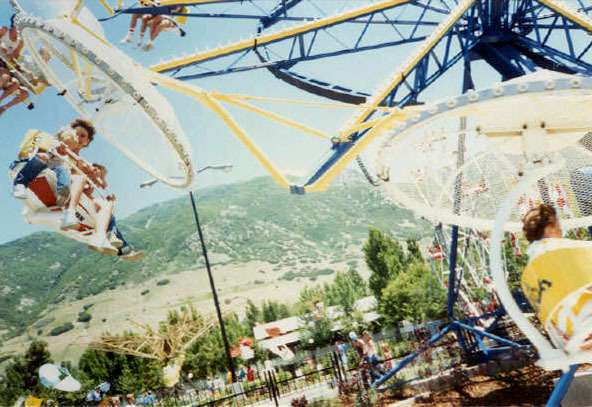 Lagoon’s Paratrooper opened as one of their “6 Super Surprises in 66” along with the Haunted Shack and an updated bumper car ride called Auto Skooters. Opening weekend featured an exhibition by real paratroopers from Hill Air Force Base and six sky diving Easter bunnies. At first the Paratrooper was located just south of the “New Sportscar Speedway” (later known as Speedway, Sr.) Later on it was moved further south, about where the Rising Waters game now stands on the other side of Wild Mouse. It was shown in that location in a 1972 aerial photograph of the park. The New Wilder Wild Mouse (the wooden predecessor to the current Wild Mouse) opened next to it in 1973. In the early 1980s the Midway was extended from this point to the west and Paratrooper was turned diagonally on the corner about where the Shooting Waters and 3-Point Challenge games are today. It was around 1986 or ’87 when it was moved to its current location on the North Midway. This Paratrooper is a standard ground unit as opposed to a trailer-mounted model used at traveling carnivals. Some have said it used to be painted orange and white and that it was repainted blue and yellow when it moved to the North Midway. Different graphics were added in the ’90s. In the 2017-18 off-season, the ride was dismantled and repainted again in blue and green. The 1980s Lagoon logo was painted on the back of each gondola.² A replica of the sign that used to be on the ride structure was added. Lagoon had one other Hrubetz ride around the late ’60s to early ’70s called Satellite (a Hrubetz Roundup) which some remember being where Boomerang now stands. Paratrooper is often overlooked and forgotten as guests pass by on their way to more popular rides like Samurai or The Rocket. Maybe they’re distracted by people being launched on Catapult on the other side of the Midway or they just don’t see the queue hidden behind the fairly large bushes. 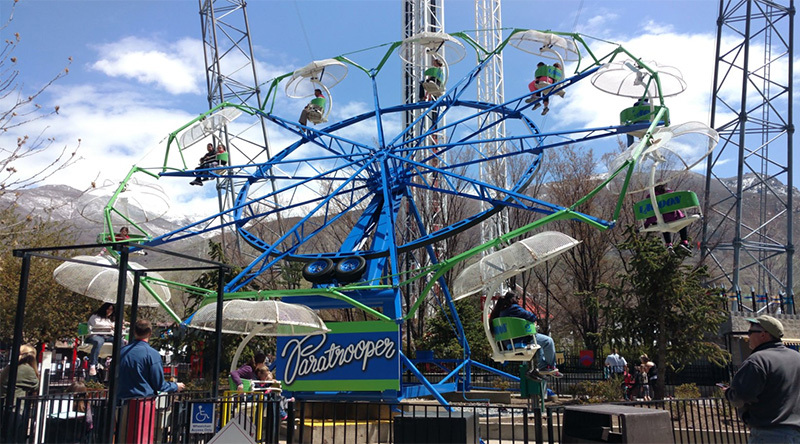 Some may just pass it up because of the slow-moving line and long ride time due to the fact that only two gondolas can load simultaneously.³ But Paratrooper is an American-made classic that has been well-maintained at Lagoon for many decades. It’s still stimulating to get the brief sensation of jumping out of a plane and experience what thrill rides were like before towering steel coasters became commonplace. 1. Click here for a photo of a Hrubetz Spitfire. 2. This is the first time the 1980s Lagoon logo was painted on a ride since 1987. Click here to read more about the Lagoon logo. 3. Hrubetz later developed a hydraulic model with the wheel starting parallel to the ground for faster loading, then raised up at an angle similar to Lagoon’s Centennial Screamer. 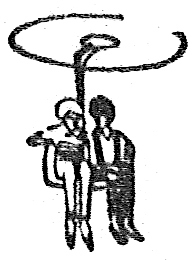 Paratrooper ad. The Billboard, 24 Aug 1959. Sellard, Dan. The Fun Fabricators. Eugene Register-Guard, 15 Aug 1971. Young, Bryon. Round Trip: 1942 – Comment: Spitfire memories. Shorpy.com, 15 Dec 2010. Lee Eyerly. Salem Online History, accessed 28 Sep 2014. Frank A Hrubetz. FindAGrave.com, accessed 14 Oct 2014. I do remember the Paratrooper ride being located at the south side of the park as a kid, because I remember being able to see the Fire Dragon “Colossus” while riding. You’re right. I have a screenshot from the video in the Paratrooper Gallery. I love the Paratrooper. My mom first got me to ride it around 1984 (about age 9), and it became my favorite for years. I took my son on it for the first time last Saturday, and I was shocked at how unpopular it seemed. It was probably the shortest line I saw that day. Maybe it’s the strict “no open-toed shoes” rule. I hope the Paratrooper stays at Lagoon for a long time. I agree. It’s very overlooked, but a great ride.